Along with increased complexities in work and life in general in the twenty-first century come new and dangerous risks to workers, customers, and the general public. 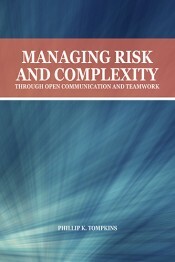 Drawing on decades of experience as a researcher and consultant for a range of organizations and individuals in high-risk domains, the author of this book presents a powerful theory of open communication and teamwork. This unites a range of communication practices and principles that have proven to combat risk and complexity in organizations. The book initially focuses on NASA, an organization that experiences and engages with high complexity and risk daily. As a participant-observer in the Apollo program, the author witnessed pioneering communication practices that, for example, empowered engineers with “automatic responsibility” for any technical problem they perceived. It was partly the failure to follow such protocols that resulted in the catastrophes experienced in the Challenger and Columbia tragedies, as the author shows. Using the lessons learned from the space program, the book then explores complexity and risk in medicine, aviation, the fighting of forest fires, and homelessness, again consistently finding communication practices that worked and did not work. Based on detailed research conducted over several decades, the book presents a unified theory linked to generally applicable communication practices. Case studies include the results of an international experiment of surgery conducted in ten countries that produced a highly significant reduction of deaths and infections in Africa, India, and other parts of the world, to the creation of innovative communication practices that significantly reduced risks in the US aviation industry. Essential insights from a career of world-class research! Tompkins’s many years of highly distinguished scholarship culminate in a remarkable volume demonstrating the vital role organizational communication theory plays in solving our most pressing institutional problems. 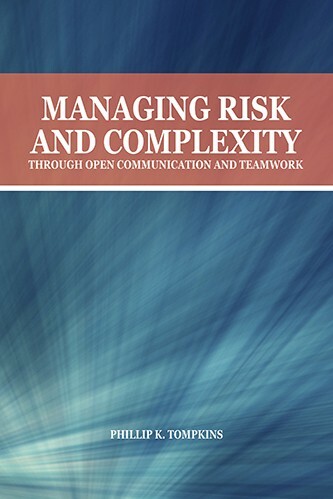 Spanning the full range of Tompkins’s contributions, Managing Risk and Complexity delivers the knowledge today’s managers and scholars must have to navigate twenty-first-century organizations. In Managing Risk and Complexity, Phil Tompkins provides us with a thoughtful and meticulous guide for strengthening communications in any organization. Throughout the book, to stimulate the thinking of the reader, he skillfully uses relevant and pithy case studies to unveil the pathways of what matters most when a team sits down to tackle the complex challenges facing contemporary organizations. This book is a highly valuable read and is destined to become a frequent resource for communications professionals trying to do the right thing. This is a must-read for academics and practitioners in STEM, the social sciences, the humanities, and the arts. Through vivid case studies of his lived experiences at NASA, the St. Francis Center for homeless persons, and universities across six decades, Tompkins celebrates the inextricable tie between scientific discovery and innovation, organization, and communication. He demonstrates that organizations in public and private sectors are constituted by communication and that effective organizations are those in which open communication and teamwork are genuinely embraced and practiced, with ethics, courage, and care for others at the core. He invites and compels us all to act toward and fight for communication practices that reduce risk and lead to more effective, ethical organizations. Phillip K. Tompkins is well known in the field of communication and beyond because of his long and exciting career as professor, researcher, literary critic, and author. After receiving his PhD in organizational communication from Purdue University in 1962, Tompkins was a consultant to NASA working under the legendary Wernher von Braun during the development of the Saturn V (the “moon rocket”). Throughout his career as a professor, he maintained productive research programs at Wayne State University, Kent State University, the University at Albany, Purdue University, and the University of Colorado at Boulder. He has continued this record since his retirement in 1998, producing three books and racking up sixteen years in the trenches as a volunteer at the St. Francis Center, a homeless shelter in Denver, Colorado.